“The tapes sound beautiful. Thank you for the great job and the pleasant, courteous service. Hidden away in attics, basements, closets and garages are old sound recordings, videos and photos of people, places and events that have special meaning to someone. 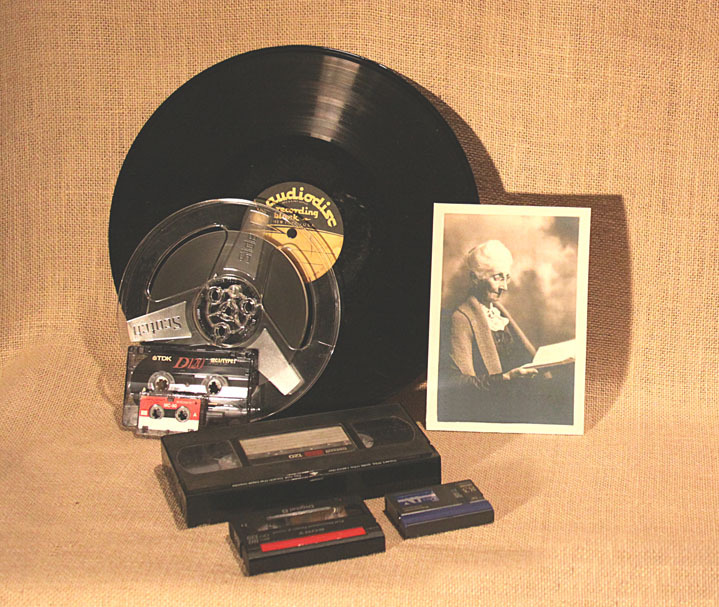 Restoration is the term we use for converting these unique sounds and images to compact disc, DVD or high-resolution print. Restoration is a far more sophisticated process than it may seem. Although eager amateurs may be more than willing to attempt such conversions, there is considerable risk involved in entrusting irreplaceable original materials to someone who might either damage or destroy them altogether. Savvy clients understand the wisdom of having their priceless original acetates, vinyl discs, audiotapes, videos and photographs handled professionally. The process begins by creating a digital file. Digitizing is necessary because no one has invented a machine that allows dropping an original in at one end and having the finished product pop out the other – like with a photocopier. Transferring original materials directly to disc isn’t practical either because of the difficulties that may arise along the way. In playing a disc recording, the stylus (needle) can skip a record groove – or become stuck in one. A 78 rpm disc requires a specific type of stylus for optimum sound transfer. Open-reel tapes may contain splices that fail on playback. Even when properly handled, an old, brittle tape may break and require repair. There are a variety of playback speeds and head configurations to be considered. The tape in vintage audiocassettes may have become tangled or broken. An audiocassette may be missing a pressure pad, and the tape may need to be transferred to a new shell. In video, the tape may be tangled, broken or detached from the takeup spool. A damaged section may need to be removed in order to save the rest of the tape. A video may need special effects added to ensure maximum picture quality. Vintage photos may be damaged and require special handing. Photos may also need extensive retouching to repair damage. Nearly all of these matters may be addressed using specialized methods developed in this studio since 1967. Once created, a digital file can be manipulated with the highly skilled use of one or more digital workstations. Digitizing is truly necessary. Below are the reasons why. In audio, there is a rather strict limit to the absolute recording level acceptable by a compact disc. Beyond that limit, distortion becomes both immediate and severe. Careful use of the digital workstation allows determining the overall level of original recordings as well as the exact locations of occasional peaks. Once digitized, the level can then be set precisely for distortion-free transfer to CD. Professional CDs may contain a maximum of 80 minutes of audio. Longer programs may require additional discs. Use of the digital workstation in dubbing to CD allows determining the exact running time of the program, as well as where a longer program might be appropriately divided for transfer to two or more discs. The greatest benefit of the digital process is the capacity to repair, restore or enhance poor-sounding recordings. Background sounds can be reduced, voices brought further forward, unwanted music or dialogue deleted, missing sections restored, annoying noises corrected, speed and pitch adjusted and monaural recordings enhanced for a pleasant stereo effect. All of these benefits are available to you only through the skilled, creative use of digital audio. Whatever it may be, don’t attempt to play it first. Without meaning to, you may cause harm. Carry open reel and cassette tapes in a clean paper or plastic bag. Disc recordings may be delivered in their original sleeves or jackets. Or, line a clean, unused corrugated cardboard pizza box with ordinary writing paper. Separate multiple discs with additional paper, then carry flat. Delivery from out of state is easy enough. Package very carefully, then send only by Certified U.S. Mail or United Parcel Service. *Assemble series of photos as movie on DVD - Please ask for estimate. Skilled, creative use of digital technology to determine and then control the volume, length and condition of your original sound recordings and videos provides you with maximum quality in transfer to disk. The same system applies to restoring and preserving your priceless photos and documents from long ago. The secret, of course, is not the system but the operator.